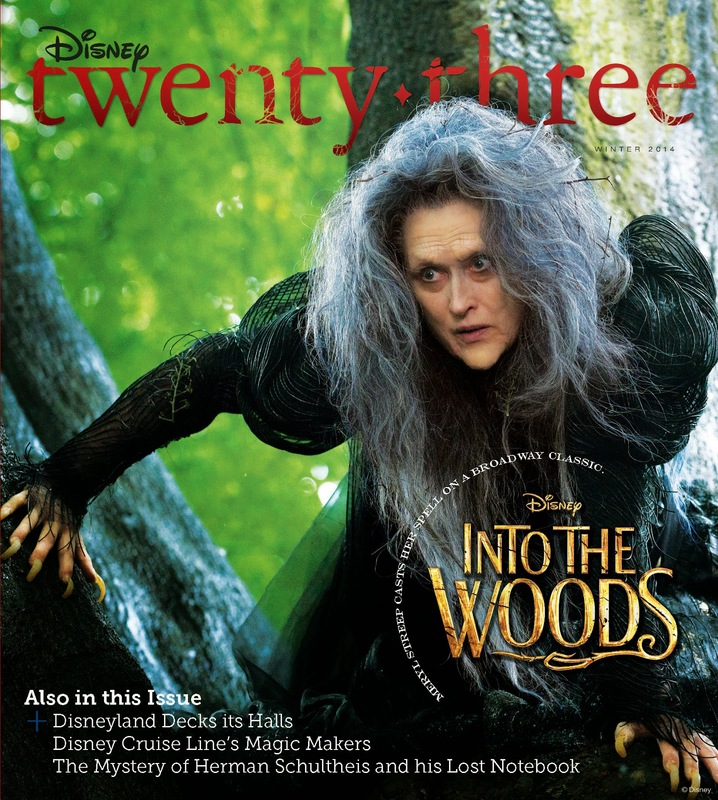 BURBANK, Calif. – NOVEMBER 10, 2014 – To celebrate Disney’s big-screen adaptation of the hit Broadway musical Into the Woods,Disney twenty-three, the publication of D23: The Official Disney Fan Club, got all the thrilling details from the stars and creative team behind the new breathtaking, upcoming film. In exclusive interviews with Disney twenty-three, stars Meryl Streep, Emily Blunt, Anna Kendrick and Chris Pine, along with director Rob Marshall and screenplay author James Lapine, detail the excitement and challenges of bringing the Tony® Award-winning musical to the big screen, including explaining how they played a game of hide-and-seek with some (fake) witchy fingernails and how the team gracefully—and sometimes hilariously—handled Blunt’s pregnancy during filming. Disney twenty-three’s Winter issue, available exclusively to Gold Members of D23, also includes a fascinating look “behind the seas” at Disney Cruise Line, with dazzling photography that reveals places guests never see while on board, as well as interviews with the people who keep everything shipshape. “It’s Beginning to Look A Lot Like Christmas” unlocks the secrets that enable the creative teams at Disneyland to bring the holidays to life, seemingly overnight. Director Steve Purcell unwraps the newest Disney•Pixar television treasure,Toy Story That Time Forgot, which airs on ABC December 2. Star Hayley Atwell and producer Jeph Loeb unleash the action of Marvel’sAgent Carter, also coming to ABC, which brings one of Captain America: The First Avenger’s most thrilling stars to the small screen. All D23 Members are invited to visit D23.com for additional features and members-only content, including our “D23 Days of Christmas” celebration, where members can unwrap stories, videos, printables, and more beginning December 1. Additional Into the Woods tales including a “character who’s who” and a discussion with James Lapine and Rob Marshall about the changes made in taking the show from stage to screen. Disney twenty-three, which is delivered directly to fans’ doorsteps, is offered exclusively to D23 Gold Members as a benefit of their membership. The publication will begin arriving mid-November. Fans can join D23 at Gold, Silver, and General Membership levels at D23.com and at DisneyStore.com/D23. To keep up with all the latest D23 news and events, follow DisneyD23 on Twitter, Facebook, Pinterest, Instagram, and YouTube.